The hardwincing staff has endured this example of American linguistic carnage too long! Plug “based off of” into the Googletron and you get over 17 million search results, among them this admirable dissent from GrammarBook.com. Once again we say: There should be a Syn Tax – a monetary fine – for every grammatical error in America. Google can be the referee. Imagine the possibilities in the Halls of Congress. 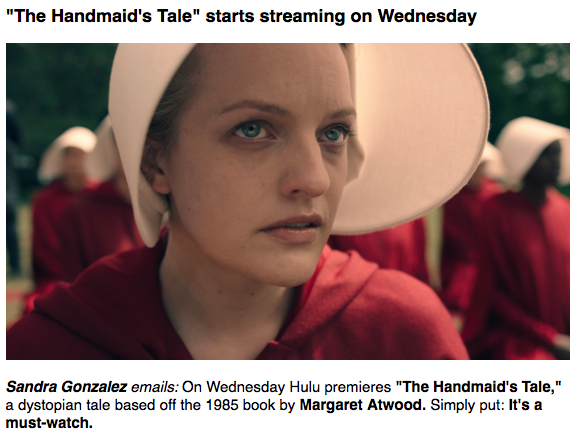 This entry was posted in Uncategorized and tagged Associated Press, Brian Stelter, CNN Money, Donald Trump, Elisabeth Moss, Elizabeth, Googletron, GrammarBook.com, hulu, Margaret Atwood, Reliable Sources, Syn Tax on Bad Grammar, Syn-tax, The Handmaid's Tale. Bookmark the permalink.